PANCHTHAR, Sept 14: Yasok, Swabaruma and Ranigau villages are popular for their natural beauty. But they are equally notorious for acute water crisis. Residents of these villages were largely hopeful that the under-construction Tamor Lift Drinking Water Project would relieve them of water scarcity. Though the project was supposed to come into service by December, it has come to a grinding halt because of a controversy over the source of water. In its initial phase, Loripa diversion was decided to be the project’s water source. When it looked difficult to transport construction materials to the spot in lack of road, Lamughat was pitched as the possible location. However, the management team remained indecisive on it. After discussion, the management team reconsidered Loripa as the best location for water source and consequently recommended constructing road till Loripa diversion. But, the road was not constructed. This delayed the entire project and seems to have prolonged the woes of the people who have been facing drinking water crisis for years now. The main factor behind the standoff is because of the additional budget required to construct the road up to Loripa diversion for transporting construction materials required for the project. Devendra Lawati, a member of the Consumers’ Group in Loripa accused project officials of presenting faulty project estimates. “We think that the estimations made in the initial project development report were faulty. They should have studied both locations and decided whether Lamughat or Loripa could be the most feasible location as the water source for the project,” he said asserting that this has brought the project to a stand still. Apart from the inadequacies in the technical report, Lawati stated that lack of consensus among beneficiaries, local political party leaders and elected local representatives on the water source, has been hurting the project’s completion. “Though most of the stakeholders are in favor of having Loripa diversion as the source of water for the project, there are some who oppose it,” he said. Around 11 kilometer long road must be constructed to connect Loripa diversion with the road network. The estimated cost for constructing this road is Rs 60 million. And considering the budget required for constructing the road, some stakeholders are arguing to build the water source reservoir at Lamughat, Lawati said. Concerned officials have backed the option to build the water source at Lamughat. Sundarlal Chaudhari, Chief at the Drinking Water Division Office, Fidim, said project estimates and plans have been amended in favor of building the water source reservoir at Lamughat and preparations were afoot to resume the project. “Some are protesting against building the water reservoir at Lamughat, but they have to understand that it’s not possible to built infrastructure at Loripa as it lacks road. We are in discussion with the stakeholders and look forward to resume the project by taking everyone concerned into confidence,” Chaudhari said. Talking to Republica, Chaudhari expressed confidence in completing the project as scheduled. “As soon as we take the stakeholders into confidence, we will speed up the construction process so that the beneficiaries will have Tamor River’s water in their taps,” he said adding that there would be 10 huge reserve tanks and 189 break pressure tank, apart from other infrastructure. 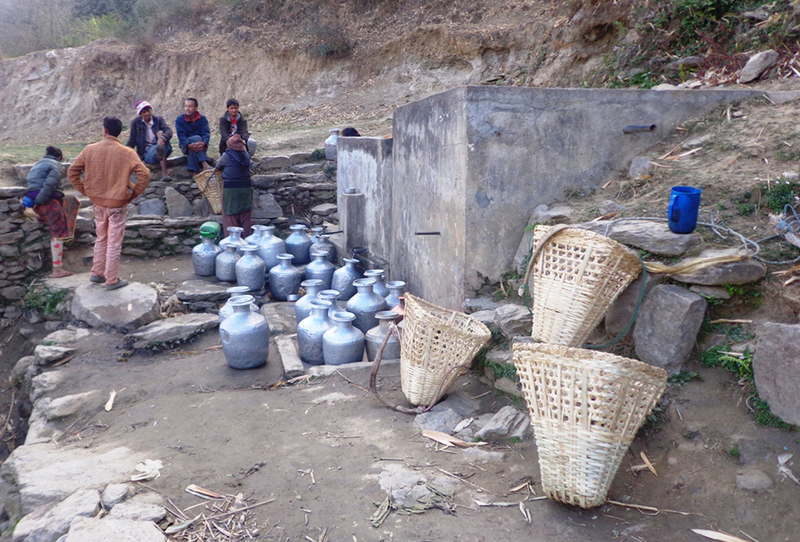 There are few water sources and taps in the villages of Panchthar. Sight of women and children waiting in long water queue is common here. Normally, they spend two to five hours each day to fetch water. Water crisis is also one of the major reasons behind the high migration rate here. The water project was brought to address this grave problem. However, their woes are not going to bid them goodbye anytime soon, it seems. “The project aims to provide clean drinking water to 3,045 households. For this 16 kilometers long transmission pipeline and 192 kilometer long distribution lines are going to be constructed as part of the project,” Chaudhari said. “A water reservoir will be constructed on the river side and water will be drawn into the pipelines using lift,” he further explained. Though the plan sounds exciting, locals are cautiously happy about it. They say the government has shown apathy towards their problem. Ghimire laments that water crisis has been taking most of their time. “We are very much affected by water crisis and fetching water leaves little time to us for doing other things. Even children are largely engaged in fetching water,” he narrated. “If the concerned officials could understand our plight, I am sure they would have accelerated implementation of the project and relieved us from our woes,” he added.